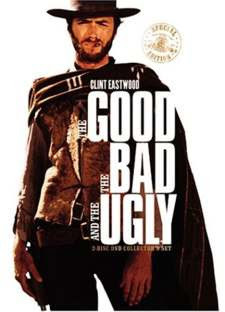 I want to thank Sergio Leone for making such a fine film as "The Good, the Bad, and the Ugly." Not only did it inspire my post-game take on today's Packers-Bengals debacle, but watching it instead of that mess of a football game would have been a much better use of my three hours. Obviously Charles Woodson was the shining star today. Two picks, a TD and a number of big stops in the running game. Watching him put the football down one step into the end zone makes me cringe--you don't want to risk screwing that one up--but his business-like approach to the game sets a good example for the young players on the team. Kind of makes you wonder if Nick Barnett is watching, but more on that later. Donald Driver continues to defy age. He came up with a number of big catches today, including a catch in the end zone with his heels on the edge of the sideline that made my jaw drop. I recently told a friend that I put Greg Jennings above him in terms of value, but I'm currently rethinking that claim. Despite an overall poor showing by the special teams unit, how about that onside-kick by Mason Crosby? Lots of top spin, just over ten yards, and perfect placement. Tramon Williams did a nice job recovering it as well. I forgave him after that for all the missed INTs he's had this season. Did anyone else not recognize that quarterback out there? Aaron Rodgers, our normally calm and collected offensive leader, was chucking balls downfield into triple coverage like he was wearing #4. Yes his wide-outs had some embarrassing drops, but Aaron didn't exactly help them out with his 70mph bullets either. It would be easy to continue to criticize, but l won't get too hasty--this is the first time we've seen A-Rodge really get taken out of his game. Let's give him a week to see how he responds. The offensive line wasn't exactly helping him either. There were plenty of mental errors again this week, from penalties to collapses. Little adjustment was made to account for Bengals D-Lineman Antwan Odom, who ended up with 5 sacks, so some of this falls on the coaches as well. You essentially have an injured player (Daryn Colledge) replacing an injured player (Chad Clifton) at left tackle--give him help. I almost forgot to give the entire front seven their due as BAD. I wholeheartedly believe they are better than this and will turn it around, but my goodness, when you get blown off the line like that and have guys repeatedly bounce off the running back, you should be ashamed. Forget that this wasn't the Cedric Benson we all knew and loved from Chicago--he did indeed run hard, but its no excuse for a unit with that much talent. Two false starts and a TD allowed today for Jarrett Bush--not good for a reserve. How did this guy finagle a long term deal? Whether it be on defense or special teams, he always seems to be around when things go wrong. Here's hoping the injury to Nick Collins isn't serious--I don't want to waste Woodson by moving him to safety. Nick Barnett's samurai chop. Just in general. I know you think it fires up the team, but please man, stop doing it. Its not the timing of it even, it just makes everyone cringe every single time. 3rd and 34. Not as memorable as 4th and 26, but just as embarrassing. I thought it looked like Carson Palmer fumbled before he crossed the plane of the end zone, and apparently you didn't agree. I guess that's fine--you're the ref. 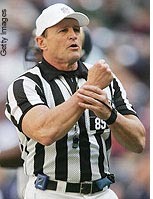 But no explanation from the most verbose referee in the NFL? I mean, you give us that rambling explanation at the end of the game, but all we get after the review is "the play stands as called?" Give me something. "There was inconclusive evidence," or, "The ball crossed the plane before he lost possession." It may have been wrong, but you at least would have stated your case. Finally Ed--and this is most important of all--you're lucky there was movement at the final snap. There were 2 seconds on the game clock, not zero. Keeping in mind your very public mistakes from last season, I think I speak for NFL fans everywhere when I say I never want to see your crew officiating my team's game again. You can take your biceps elsewhere.